CINCINNATI -- After fighting for more than a decade to save the historic King Records property, Cincinnati leaders approved a land swap Tuesday that would finally allow the city to own it. King Records was an iconic record studio that operated out of a warehouse in Evanston. Famous artists such as James Brown, Philip Paul and Otis Williams recorded albums there in the 1940s and 1950s. Founded by Syd Nathan, it became the nation's sixth largest record company and also one of the most racially integrated. Musicians worked side-by-side “at a time when black folks and white folks weren’t even talking to each other,” Smitherman said. King Records closed in 1971. Dynamic Industries eventually bought the building and planned to demolish it before city leaders got involved. For years the city fought to stop the demolition, even declaring the property a historic landmark in 2015. On Tuesday, Cincinnati City Council finally found a solution. Council’s Economic Growth and Zoning Committee unanimously approved a deal that would give the King Record property to the city in exchange for nearly two acres of undeveloped, city-owned hillside land adjacent to other property Dynamic owns. Dynamic has no specific plans to develop the hillside property, which is subject to significant zoning and development restrictions, according to the ordinance. The deal will go before the full city council Wednesday, where it is expected to be approved. “My husband Bootsy says ‘thank you,’” Patti Collins told the committee Tuesday. King Records, located in Evanston, put Cincinnati on the American music map, launching the careers of such greats as James Brown. Bootsy Collins is one of many who have been involved in saving King Records. He appeared at City Hall in 2017, along with several other musicians, asking leaders to help save the building. Once the city owns the King Records property, plans can move forward to restore the dilapidated building to its original condition. “This will take money and resources from the city to bring it back … to become a destination spot for Evanston,” said Smitherman, who said his office, and likely Mayor John Cranley’s office, will put forward plans to use city dollars for it. Plans for a newly constructed King Studios facility, estimated to cost several million, include a museum and memorial space, a recording studio and a visual art studio. 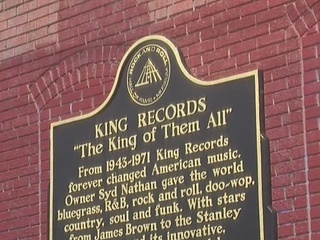 “All of us one day are going to walk in the doors of King Records and hear music,” Smitherman said.